The on-again, off-again meeting between President Donald Trump and North Korean leader Kim Jong Un has been an emotional roller coaster for South Koreans, who now await Tuesday's historic summit with both hope and doubt. The hope is that improved relations between Washington and Pyongyang will ease tensions and dispel the threat of war, which has hung over the region for more than a half-century. 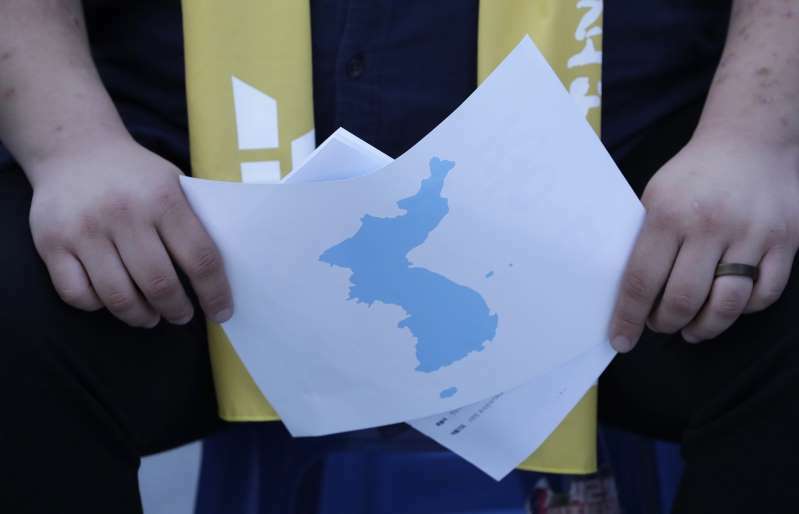 But having seen North Korea go back on its word in the past, such as when it broke a previous nuclear pact in 2002, South Koreans remain cautious about the sudden breeze of peace blowing across their divided peninsula. "North Korea's willingness for talks seems clear now. The problem is that we are not so sure what they ultimately want," said graduate student Kim Jae-hak. For him, the ideal outcome would be a formal declaration to the end the Korean War, followed by the complete denuclearization of North Korea. He warned, however, that high expectations can bring great disappointment, so Koreans should watch how things unfold. South Korea's government has been careful to avoid rash comments or hasty interpretations of the seesaw developments in the lead-up to the summit in Singapore. Still, South Korean President Moon Jae-in has made negotiations with North Korea a centerpiece of his administration and has a lot riding on next week's events. Moon took office in May 2017 with a pledge to seek improved relations and ultimately peace with North Korea. In April, he met the North's leader, Kim Jong Un, for talks at the Demilitarized Zone dividing their countries and the two set foot in one another's countries, if only for a moment. Moon's patient, yet determined diplomacy has been key to setting up the Trump and Kim meeting. He presented Trump with the initial offer of a summit with Kim. After Trump accepted and then canceled, Moon worked to get it back on track by meeting with Kim a second time. "It is critically important for President Moon Jae-in that the Trump-Moon summit goes well," said John Delury, associate professor of East Asian studies at Yonsei University in Seoul. Moon has "staked a lot of political capital in getting the U.S. and North Korea to move together in a positive way just like the two Koreas have done." The Singapore meeting would only be the start of a long process, Delury stressed. Reducing the threat of conflict is the initial goal, he said, which would be followed by cultural, humanitarian and economic steps. "A successful Singapore (meeting) gives more room for President Moon and Chairman Kim Jong Un to move forward in terms of inter-Korean reconciliation and cooperation," he said. For now, Moon seems to have public backing, with a Gallup Korea survey last week measuring his approval rating at 75 percent. Office worker Kim Jung-eun said the atmosphere of dialogue was welcome after North Korea's provocative run of weapons tests in 2017 pushed animosity to new heights. "I never truly thought we were headed for another war, but there was always a lingering fear in the back of my head," she said. "Thinking about where we were then, I am really thankful about the current atmosphere of peace. I hope that the process results in lasting peace in the Korean Peninsula." The Trump-Kim summit has fueled hopes in South Korea that the two leaders may weigh a formal declaration to end the Korean War. The 1950-53 conflict ended with an armistice, but not a formal peace treaty. Some, though, think that such talk should wait. The first priority should be getting North Korea to give up its nuclear weapons, said Im Yang-bin, a professor. "If the issue of denuclearization becomes resolved through talks a declaration ending the war will naturally follow," Im said.